Annie, a 12-year-old girl with fears no child should have, fled her home one night to escape her father’s sexual abuse. She grabbed an armful of her belongings but left her clothes behind. A few days later, Annie arrived at Safe Shores with her mom, a social worker and only the clothes on her back. Our Family Advocacy program gave Annie’s mom gift cards to Target and Walmart to help give Annie a fresh start. Supporting families through one of the most difficult times in their life requires forethought on our part. This spring and summer Safe Shores began a long-term strategic planning process for advancing our mission to provide intervention, hope and healing to children and families affected by abuse and extreme violence in D.C. 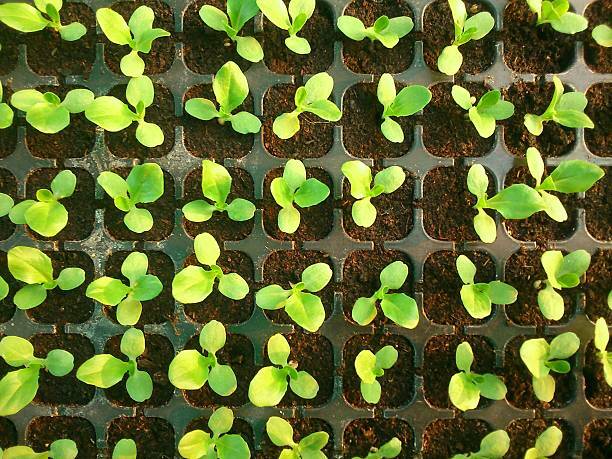 Under the guidance of an expert strategic planner, we assessed our progress on current organizational goals and developed a plan for making an impact over the next three years. Watch for the plan on safeshores.org. 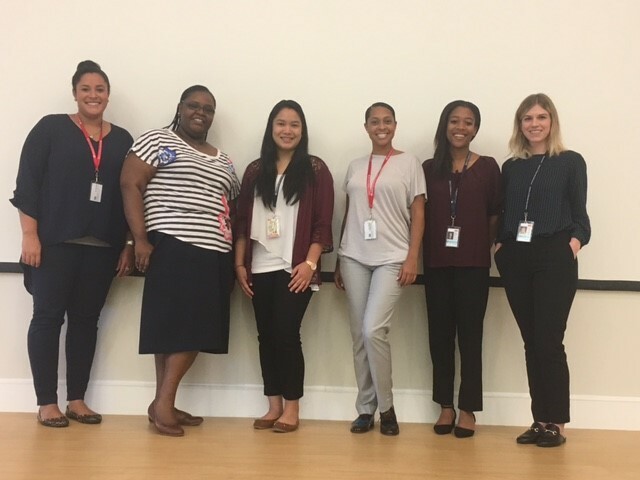 Additionally, in our ongoing commitment to build capacity for advancing the mission, Safe Shores welcomed six new staff members who arrived ready to rock and roll. We also served as a training ground for interns studying to become child welfare professionals. Safe Shores could not provide intervention, hope and healing alone. We are grateful to the Multidisciplinary Team for their vital partnership. We also deeply value donors for understanding how important it is to create safe spaces and communities for kids. Make no mistake. Child abuse is an adverse childhood experience that can be prevented. Join Safe Shores in promoting prevention and healing. Come to Coffee for Kids to tour our mission. Register for Stewards of Children® child abuse prevention training. And, always, always, stay connected to learn how you can #ProtectKids365. #SantaCause Raises $10K for Safe Shores with plans for more! 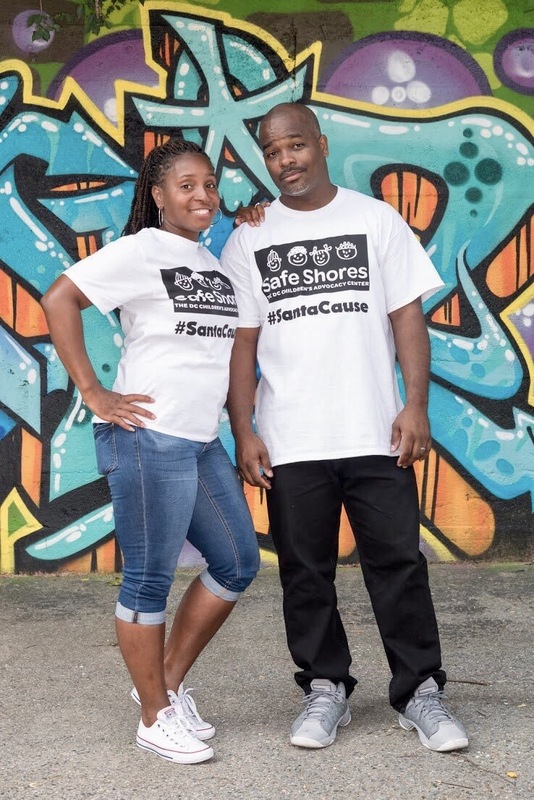 Since August, the social media campaign #SantaCause has raised $10,000 to benefit Safe Shores, and founder Maurice McClanahan and his wife Adrian are gearing up to raise much more by year’s end. Join the philanthropic pair at Art in the Afternoon on Oct. 21, from 12 p.m. to 2:30 p.m., at Muse National Harbor, 122 Waterfront St., National Harbor, MD. Tickets: $45. Proceeds will benefit Safe Shores. More than 140 children received brand-new backpacks filled with grade-appropriate school supplies from Safe Shores’ Pack2School drive. 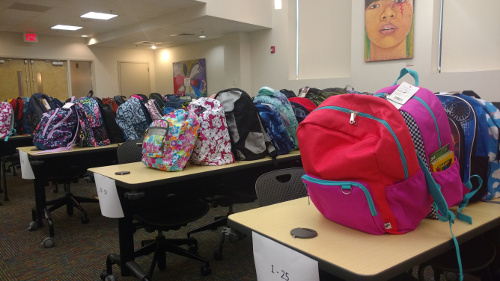 We’re grateful to the many generous individuals that donated to the drive or helped to pack the backpacks! Your support means a good start to the school year for children we serve. 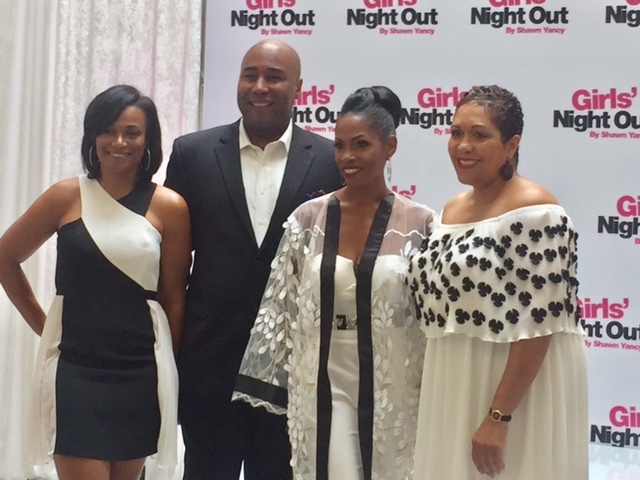 BIG thank you to Girls Night Out by Shawn Yancy for raising $10K and lots of awareness for Safe Shores! 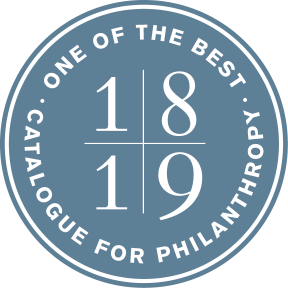 What an honor to have been chosen to benefit from the charity’s 2017 event held on August 12 at American University’s Katzen Arts Center. Since FY 2015, Safe Shores’ prevention program has trained more than 3,500 adults to be Stewards of Children® (SOC), marking a more than 70% increase in the number of adults Safe Shores trained in the previous three years combined. Woo-hoo! Let’s keep trending upwards. More trained adults means increased safety for kids. Sign up today for SOC and share the link with your family and friends. From programs to administration, Safe Shores has continued to build its capacity to serve kids and families. We’re delighted to welcome the following new staff members to the Safe Shores team! On Sept. 20, Safe Shores Prevention and Outreach Director Erin McGuinness, MPH, LGSW, trained 9 adults on how to facilitate the Stewards of Children® child sexual abuse prevention training developed by Darkness to Light. Participants hailed from Safe Shores, Mundo Verde Public Charter School, and Prince George’s County Child Protective Services and Public Schools. 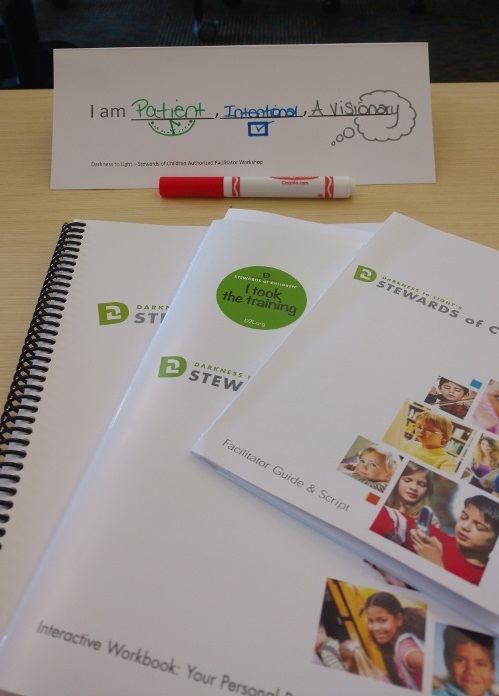 For Erin, the train-the-trainer session marked the completion of the process to become a certified Stewards of Children® trainer. Way to go! Too soon to talk about holiday giving? Nah! We know fall just arrived but ’tis the season to gear up for Safe Shores’ Holiday Giving Drive. Please plan to sponsor a child’s wish list. More details to come. Need ideas for celebrating your b’day, wedding, or other fantastic milestone? We’ve got an idea for you. In lieu of getting gifts for your special celebration, ask your friends, family and social network to donate to Safe Shores. The donations will help Safe Shores bring intervention, hope and healing to children and families affected by abuse in D.C., and make you and your peeps feel like a million bucks. How’s that for celebrating your milestone? Contact Lauren Snell, Development Associate, at lsnell@safeshores.org to get started!